Our Decals look great in any room ... choose from a wide selection of in-stock colors. 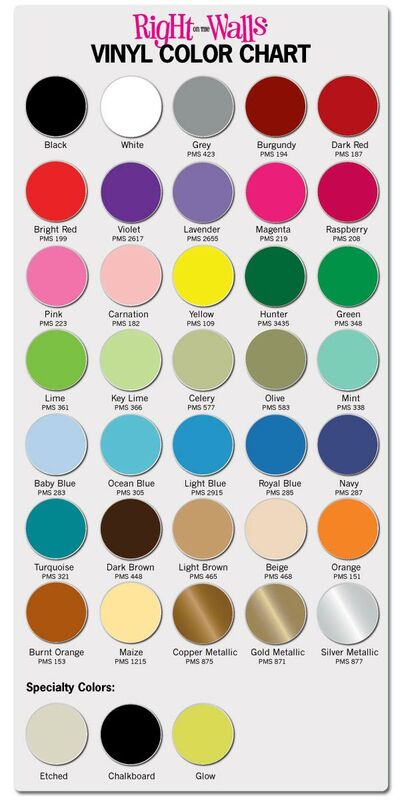 All color swatches shown below are representative of the material we carry. We strive to show the material as close to the actual color as possible but there are limitations with viewing colors over the internet. Monitor calibration settings may affect the way colors are shown on your screen. For best color matching, use the Pantone (Pantone Matching System" number written below the swatch or place an order for color swatches. All of our vinyl colors have a matte (non shiny) surface finish. We do not use glossy finish materials for indoor application due to glare from interior lighting.